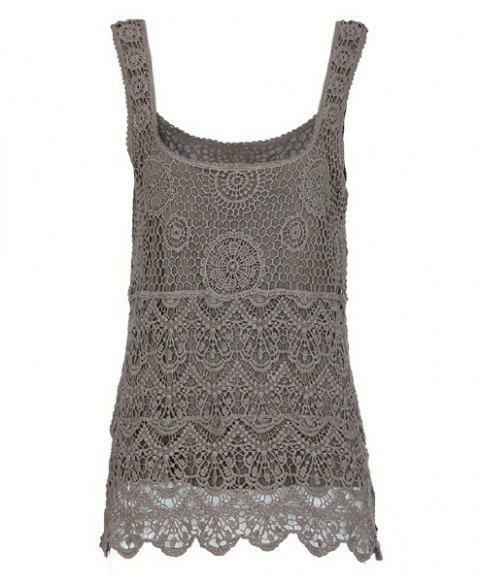 This tank is very pretty and flattering. I got it in the brown color and though I thought it would be grey it is still very pretty and I don't have many brown things so this was a pleasant surprise. I got this in a large and it fits perfectly. I normally wear small to medium in US size tops. Happy with this purchase! Q:I am confused about what colors are available. Someone in the reviewed ordered the grey but received brown. And I can't tell if the black is available. I'd prefer to get the grey, but is it really available? And if not, is the black available -- or only brown. Hi Susan. This item has 2 colors: black and color brown. But as for now, only color light brown is available. Q:How does this run compared to typical American sizes? I typically wear a small or medium and your charts say I would need an XL with a size 36 bust, which seems strange. I wish you guys would pay for shipping on exchanges, you'd sell more.